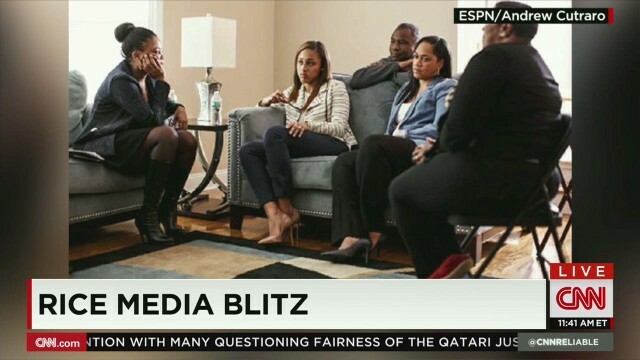 Today on CNN’s Reliable Sources hosted by Brian Stelter, ESPN reporter Jemele Hill explains how she landed the first Janay Rice interview, why she agreed to certain conditions, and what Janay feels towards the outcome of the situation. Full transcript is available after the jump. STELTER: The rest of that interview will air tomorrow on “The Today Show,” but it was ESPN’s Jemele Hill who had the first exclusive interview, which was the basis of a first-person essay by Janay that ESPN published on Friday. Jemele, thanks for joining me. JEMELE HILL, ESPN: Thank you. STELTER: You told me during the commercial break this was the first time in your career you have ever had to interview for an interview. Tell me what that was like. HILL: Well, it was a little bit different process. Obviously, with this kind of interview, Janay and her family, they wanted to basically have an array of choices. They wanted to figure out who they probably felt the most comfortable with. And so when I met her and her mom for the first time, you know, I just wanted them to understand my commitment and passion for journalism. And the whole reason that I got into this business was to tell stories. They were already fully aware of what my opinions on the Ray Rice issue had been, and I think they felt as if I were fair. That doesn’t mean favorable, but they felt as if I were fair. And I think that was a big reason why they decided to trust me with their story. STELTER: And that meeting happened several weeks before the November 5 interview? HILL: Yes, it did. It happened in New York. And it was an opportunity, you know, maybe like an orientation, if you will, a meet-and-greet, an opportunity for her to know a little bit about me, me to know a little bit about her, obviously, beyond the headlines that she had been involved with for months at that point. HILL: I just wanted to get a better feel for who she was. And it was mutual. It was vice versa. And of course that raised lots of eyebrows. So, tell me why you thought it was appropriate in this case to have her have approval over the content. HILL: Well, as you see, there have been other as-told-to stories, and a lot of them take this format. And I know the way it sounds, and I know the way it sounds for me. Again, by trade, I’m a journalist. And so I know people see that language and final approval and they envision this process of her shooting down things not to be in there. But it was in no way was this ever a dictatorship. It was fully a collaboration. She came into it with the mind-set that she wanted to be as transparent as possible. And as for the release date, this was — the interview took place during the appeals process, and it just made more sense to not publish this story until after that process had been completed. I mean, I spoke to her moments after the NFL — or the arbitrator decided to reinstate Ray Rice, because that was something, a reaction we wanted included in the piece. And it was stuff that I wanted to have. So when I did speak about her in the piece, I can say, well, I spoke to her and this was her reaction to the appeals process. STELTER: It’s so interesting to see her talking to the media, because let me put up what she put on Instagram over the summer. She was attacking the media, talking about the pain that the media had caused. I think she meant opinions from the public, not options. But did she say anything to you in this three-hour-long interview about the media and about how she is now utilizing the media? HILL: Well, I think that was part of the reason why she was motivated to speak, is that she had gone months without saying anything. And I just — putting myself in her shoes, I imagine it’s extremely frustrating to see people like me and you and people in social media, other media pundits who are opining about her mind-set, about her relationship, about the type of woman she is. And this was her opportunity to set the record straight and to present to people who she really is. And, you know, while on some end, I know there’s a certain irony in railing against the media and collaborating with them at the same time, but I think that’s why she went through the process so carefully to choose somebody who she felt like was going to be fair. STELTER: Oh, no doubt. Sources have more power than ever to choose who to talk to. Did you get a sense from her that she really feels that this has had a positive outcome in that way? HILL: Well, I think obviously she would not like to relive the situation. I think that that’s pretty obvious. However, as she told me, there were certain positives or a silver lining, if you will, that came out of this. Among the many was the fact that the level and awareness of domestic violence is now, you know, maybe more than we have seen in this country in quite some time. The other side of her, from a personal level, too, is that she felt like she learned a lot about herself, about her own strength, the strength of her family, the strength of her relationship with her husband. So, even though it was horrible and traumatic, and there’s going to be some probably long-term emotional damage from this entire episode, I think that she has enough perspective to understand that there was something larger and bigger at play than just the microcosm of her situation. STELTER: She’s very self-aware. Jemele Hill, thanks for being here this morning.